After living in his car for over a year, web developer David Casarez began sleeping on a park bench in Mountain View, California as the vehicle was repossessed last month. 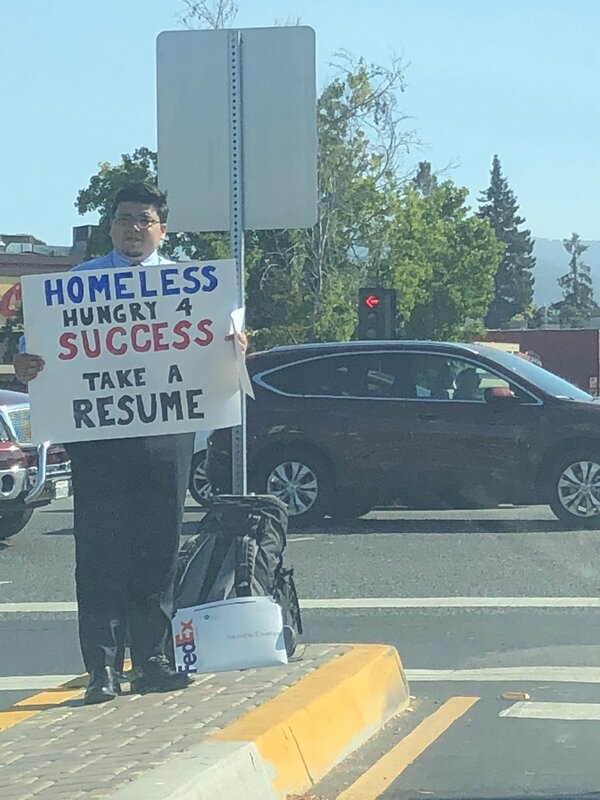 Running out of money and luck, he had a clever idea that would lead to job offers from Google and hundreds of other companies. Casarez completed his Bachelor’s Degree in Management Information Systems from Texas A&M University. Right after college, he was able to land a job as web developer job at General Motors in Austin. While the job had a lucrative salary, Casarez had always dreamed of working in Silicon Valley, just like many other IT graduates. So, he quit his high-paying job at General Motors, cashed in on his 401(k), and drove to Silicon Valley in his 2015 Ford Transit Connect utility van. Things weren’t as bright in Silicon Valley as Casarez had hoped. While he was able to land some freelance gigs, all the companies he had applied to just weren’t hiring at the moment or were not looking for someone with his level of skills and expertise. “No one was hiring. I had an interview with Apple in January, but the job was filled internally,” he told reporters. Because he found no real job in Silicon Valley, he lived in his van for over a year. But as his money ran out, the van was repossessed. All he had left were a few clothes and personal belongings. Living in the park was harsh; Casarez knew he had to do something to change his situation or go back to his hometown and admit defeat. 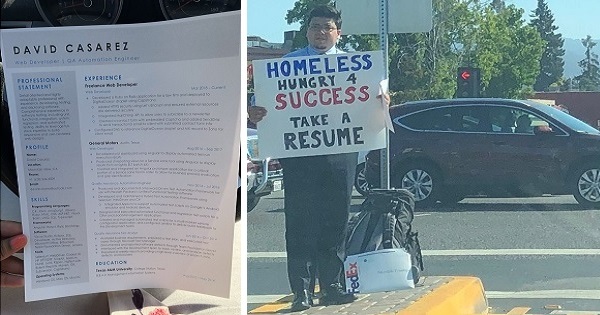 Then, he donned his best corporate attire “to be presentable to my future employers”, before standing on the median at El Camino Real and San Antonio Road, with the sign on his hands and a stack of resumes at his feet. He had been standing there for a couple of hours when Samoan makeup artist Jasmine Scofield drove by. Thinking that Casarez badly needed help but admired him for seeking a job instead of asking for money, she decided to help. Within hours, the tweet went viral. It now has over 137k retweets and 220k likes! 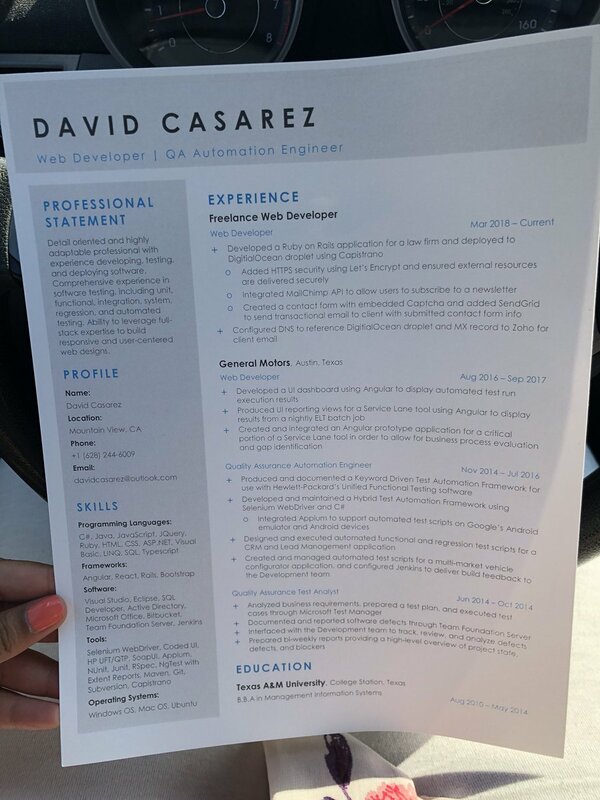 With the post becoming viral, hundreds of job offers poured in for Casarez, including one from Google and another from Pandora. “Google reached out to me,” a rather overwhelmed Casarez told the New York Post. 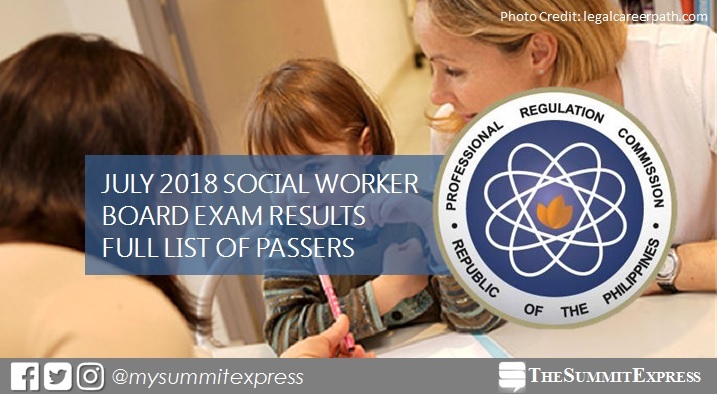 MANILA, Philippines – The Professional Regulation Commission (PRC) hailed the top performing schools in the July 2018 Social Worker board exam. The results are released on Tuesday, July 31, 2018 or in three (3) working days after the exam. Bicol University (BU) - Tabaco topped the schools with 91.07% or 51 out of 56 passed the exams. BU-Daraga ranked second with 90.60% or 106 out of 117 successfully hurdled the tests. PRC conducted the licensure exam in Manila, All Regional Offices and Zamboanga on July 25 and 26, 2018. In the June 2017 ALE, PRC recognized Leyte Normal University (LNU) as the top performing school with 100% passing rate or all 67 examinees passed the exams. Bicol University - Daraga ranked second with 98.78% or 162 out of 164 successfully hurdled the tests. In the July 2015 exams, Bicol University - Daraga led the schools with 97.06%, 66 out of 68 passed. Saint Louis University (SLU) took the second spot with 94.67%, 71 out of 75 passed. Monitor this page for the real-time updates on Social Work exam results. Check out also the official website of PRC for more information. 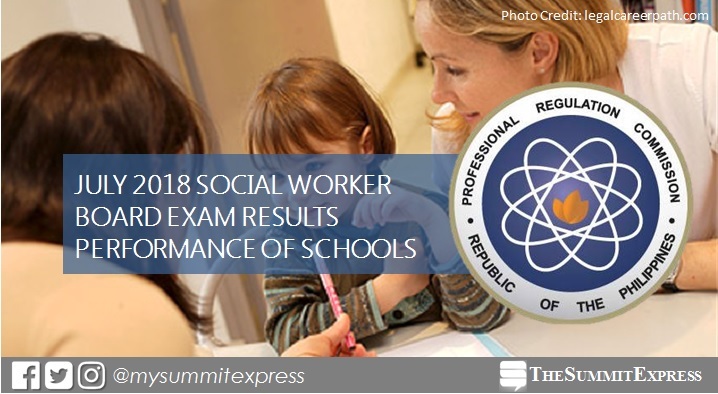 MANILA, Philippines – The July 2018 Social Worker board exam results to include the full list of passers, top 10 (topnotchers), top performing schools and performance of schools are released online on Tuesday, July 31, 2018 or in three (3) working days after the exam. As announced, 2,508 out of 5,020 passed the exams. The Professional Regulation Commission (PRC) and the Board for Social Workers conducted the licensure exam in Manila, All Regional Offices and Zamboanga on July 25 and 26, 2018. From August 3 to August 7, 2018, registration for the issuance of Professional Identification Card (ID) and Certificate of Registration will be done on-line. Please go to http://online1.prc.gov.ph and follow instructions for initial registration. In few days after the release of results, the Verification of Rating (VoR) page of PRC for July 2018 Social Worker board exam will be available online. Enter the required information - exam name, exam date, application number, name and birthdate to verify identity. The two-day exam covered the following subjects: human behavior and social environment and social welfare policies, programs and services (Day 1); Social Work Practice and Field Instruction (Day 2). According to PRC Resolution No. 2017-1068, which deals with the 'Schedule of Licensure Examinations for Year 2018', the target release date of Social Worker board exam result is on Tuesday, July 31, 2018 or in three (3) working days after the exam. However, results might be released ahead of the target or on later date, without prior notice. In the same period last year (July 2017), results were released online after three (3) working days. PRC named 3,951 out of 5,997 who passed the the licensure exam. In the June 2015 exams, results were out in just 2 working days. A total of 1,817 out of 2,6544 passed the tests.